The Navarre Bible does not need a lengthy introduction. Developed by the faculty at the University of Navarre in Spain, this commentary series has become a standard for those seeking to understand the Scriptures from the heart of the Church. The Catechism of the Catholic Church, following Dei Verbum, says: "Read the Scripture within the living Tradition of the whole Church. According to a saying of the Fathers, Sacred Scripture is written principally in the Church's heart rather than in documents and records, for the Church carries in her Tradition the living memorial of God's Word, and it is the Holy Spirit who gives her the spiritual interpretation of the Scripture (CCC 113)." This is the primary aim of this Bible series produced by the University of Navarre. Over the years, the Navarre Bible has come in multiple editions, ranging from individual volumes to collected and compact editions. Utilizing the original RSV-CE translation, along with the Nova Vulgata, these volumes have proven to be popular and helpful to many Bible students. The American publisher of this series is Scepter Publishers, known for their connection to Opus Dei and St. Josemaria Escriva, as well as their many other helpful books which focus on daily spiritual growth. 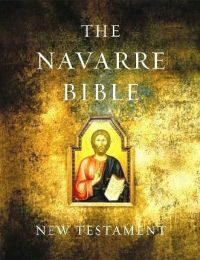 Recently, Scepter Publishers released The Navarre Bible: New Testament, which is a wonderful combination of physical beauty and helpful spiritual commentary. First things first, let's take a look at the book itself. (If you are interested in seeing some sample pages, please check out the sample pages on the Scepter site here.) If you remember back to my review of the ICSBNT, I mentioned that it was quite large. Well, The Navarre Bible: New Testament is even bigger! At a size of 7 x 10 inches, it is massive in both size and weight. However, do not let that discourage you, since it is full of substantial commentary and introductory essays which will only help you to appreciate the need for its size. This hardback edition is very sturdy, while easily opening up flat on a desk or in your lap. Included with this edition is a helpful ribbon, which should be standard on all Bible, but I digress. Just holding The Navarre Bible: New Testament, one can instantly appreciate the care that was given to producing this volume. The real jewel of this volume is the page layout. It should be instantly familiar to anyone who has used the Navarre series before, or to a lesser extent the Jerusalem/New Jerusalem Bibles. Using the always elusive single-column format, which is so rare in most English Catholic Bibles translations, the text is enjoyable to read and enhanced by the use of red to mark not only the paragraph headings and chapter numberings, but also the side scripture cross-references. I find that the red and black go very well together. In addition, the cream colored paper is thick enough to avoid too much bleed-through and there are sizable 1 inch margins for those who wish to include their own annotations. The RSV-CE text is separated from the commentary by the Nova Vulgata, which should prove to be helpful to anyone looking to sharpen their Latin skills. As mentioned earlier, cross-references are plentiful, and consigned to the sides of each page. The overall look is very sharp and truly delightful to read from. Again, this is something that I would like to see other Catholic Bible publishers attempt, most notably the RSV-2CE, NAB, and NRSV. Of course, the main reason anyone would purchase The Navarre Bible: New Testament is for the book intros and commentary. As I noted at the top, the Navarre commentary series focuses on reading the Bible with the heart and mind of the Church. Therefore, while you will not see much in the area of historical-critical notes, the real focus is on the writings of the Church Fathers, Councils, the Saints and Popes, and the Catechism of the Catholic Church. You will find quotations from the letters of Clement of Rome and Ignatius of Antioch all the way to Pope Benedict's Spe Salvi, published in 2007. So it truly covers the whole of Christian history, principally in the West. Included in the front of the book are some black and white maps, as well as helpful essays on the New Testament's Place in the Bible, an Introduction to the New Testament, an Introduction to the Gospels, and Dating the Life of Jesus Christ. Placed within the New Testament, itself, are additional introductions to Paul's letters and the Catholic letters. The Navarre Bible: New Testament concludes with a subject index and a list of all the sources used in the volume. Each Biblical book, along with commentary, includes a fairly lengthly introduction as well. I can easily see how this volume could be used in tandem with a commentary series like the Ignatius Catholic Study Bible or the Catholic Commentary on Sacred Scripture. I recently was leading a Bible study on Acts 15, and while I was preparing for the meeting I felt that I needed something a little more to tie everything together. So, I looked into my copy of The Navarre Bible: New Testament and found just what I was looking for. Helping to summarize the events of the council of Jerusalem in Acts 15, there was a helpful quote from Melchor Cano, a Spanish theologian of the 16th century which really summed up importance of this council. I ended up quoting directly from the text, which I think went over really well with the audience. Overall, I give The Navarre Bible: New Testament high marks! Obviously, for some, the size may be an issue. This, much like the ICSBNT, is not one that you will be carrying around with you everywhere you go. I think I have mentioned on this blog before my hopes that someday the entire Navarre series could come in a single volume, much like the format of the Jerusalem Bible. While that may be a bit difficult to pull off, it may be worth the effort. The Jerusalem and New Jerusalem Bibles are able to cram quite a bit of commentary into their one volume standard editions. Also, while it is certainly worth it, it is expensive, coming in at around $80.00. This may hold some people off from buying it, which would be a shame. Other small quibbles would be the use of the older RSV-CE and the use of black and white maps, but these are certainly not major issues in my mind. Ultimately, this is a great study tool which, combined with some of the other recently published Catholic Bible study materials, will enhance every Catholics understanding of the Bible, thus leading them closer to the Sacred Heart of the Word made flesh. How do you rate the Compact Edition of the Navarre New Testament? I know it doe snot include the Latin Vulgate and that's fine for me. Also I have heard - but do no know - if the compact edition includes the comments from Escriva. This may be fine and good for an Opus Dei member but I prefer to stick with commentary by Fathers of the Church or renowned theologians instead. Do you have any information about this? Also, the cost of the compact edition is half of this edition. I left my copy of the Compact version at school, so I will check it out next time I am there. Perhaps someone else could comment on it? You have to do good work buddy. I'm looking good blog/site for post my comment. Now I got it. I'm very happy to your blog/site. Just out of curiosity, what is anyone's opinion of the Douay-Rheims Bible with the Haydock commentary? I would love to read your comparison of this with the Ignatius Study NT, particularly the difference in the *commentary,* of course, and any other stand-out factors. It would be really helpful in making a purchase decision as I have to be very careful with spending choices. (I'd like to get both.) I get the impression that the Navarre is the 'gold standard" but the Ignatius is so much cheaper. Is it a case of you get what you pay for, or a very different approach to commentary and aid to understanding, or...? Thank you. Thank you for the detailed review. I did a quick google search after mass today when I saw this bible in the Cathedral book store and your review popped up. Thanks to you when I saw that the book was new in the plastic and TWENTY DOLLARS!! I bought it immediately! A quick scan of the first chapters of Matthew and John and I am very pleased and excited to begin using this excellent resource.